Two Ottawa 67’s players have been honoured by the OHL for their performances over the month of November. Centre Marco Rossi has been named Rookie of the Month for November, while Noel Hoefenmayer has been named Defenceman of the Month. In 12 games in November, Hoefenmayer put up three goals and 13 assists for 16 points, while maintaining a plus-minus rating of plus-nine. Sidelined for the last few games of November due to an injury, Rossi nonetheless picked up right where he left off after being named October’s Rookie of the Month. In seven games during the month of November, Rossi had four goals and five assists for nine points. 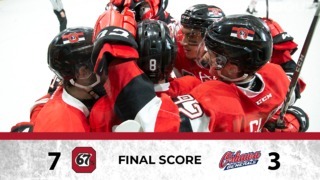 The 67’s are back in action this week as they take on the Gatineau Olympiques in the Battle of the Ottawa River, a home-and-home series starting Friday night in Gatineau and wrapping up at The Arena at TD Place on Saturday afternoon. Alumni for both teams will hit the ice for a game before Saturday’s main event between the junior clubs. 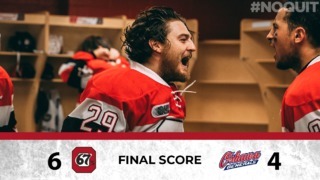 Tickets for the game in Ottawa on December 8th are on sale at ottawa67s.com or at TD Place’s Box Office. 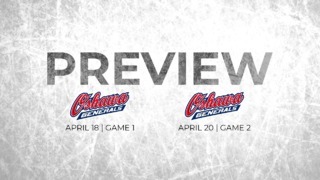 Tickets for the December 7th game in Gatineau, are available at www.ovation.qc.ca or at the Robert Guertin Centre.